I am a very reluctant movie goer, much preferring TV to movies. On the rare occasions that I get talked into it, the movie trip has to be incentivized with a big tub of popcorn. There's nothing quite like movie popcorn- the crunch, the savory aroma, the salt and butter, well, butter-like substance. It is so good and so bad. Friday nights are family movie nights at our house but only rarely accompanied by popcorn; we tend to eat dinner while watching the movie. Part of the reason is that I don't like microwave popcorn, and I've tried making stovetop popcorn with very meh results. The popcorn on the bottom of the pot burns and there are too many unpopped kernels left behind. And so a jar of popcorn kernels was quietly hibernating at the back of the pantry. Last week, in the throes of spring cleaning, I decided to use it or lose it. A quick web search led to a promising recipe (well, it had "perfect" right there in the title) and in one of those everyday miracles, the recipe actually worked exactly as it said it would, the first time around. The first trick is to heat the oil with a couple of kernels so that when those test kernels pop, you know that the oil is exactly at the right temperature. Then the rest of the kernels go in, at which point you use another trick, pulling the pot off the heat so that all the kernels get a chance to get heated up uniformly. 1. Add 1/4 cup coconut oil and 3 popcorn kernels to a large pot. Remove the 3 popped kernels. 3. 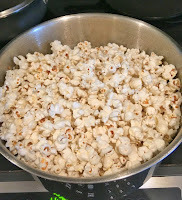 Add 2/3 cup popcorn kernels, then quickly cover the pot and remove it off the heat. 4. Wait 30 seconds (set a timer). 5. Put the pot back on the heat and cook, shaking the pot once in a while. 6. After about 2 minutes, as the popping slows down, leave the lid ajar on the pop. This lets the steam out and keeps the popcorn crisp. 7. Pour the popcorn into a huge bowl, or divide among two large bowls (you need space to mix). Sprinkle with salt and honey-butter if desired (the latter made by melting together a couple of tablespoons each of butter and honey). Toss very well and serve right away. 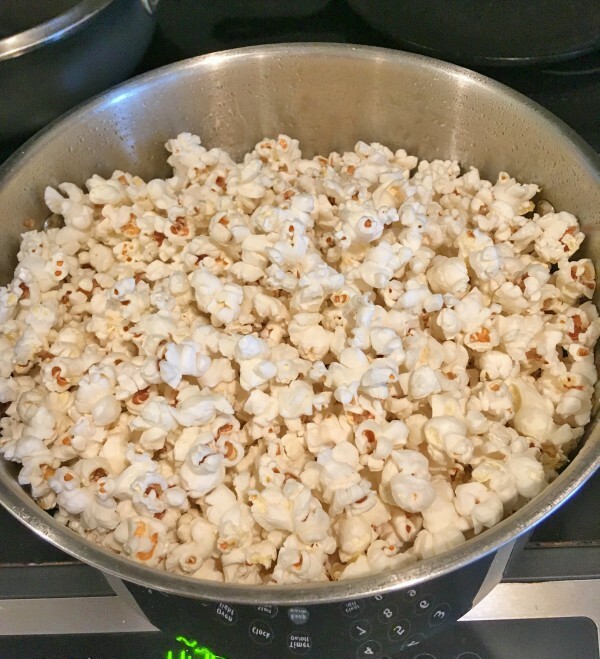 This popcorn was delightful- no unpopped kernels, it fluffed up to fill my stockpot and is the perfect amount to serve a family. Even with my stale kernels which resulted in slightly chewy popcorn, the kids and I enjoyed every bit of it. Next time I will grind some kosher salt in the blender to make very fine popcorn salt which salts the popcorn more easily. Earlier this month, March 2 (Dr. Seuss' birthday) was celebrated all over the country as Read Across America day. It is a big celebration in Lila's book-loving elementary school. The kids get to go to school dressed as their favorite book characters. 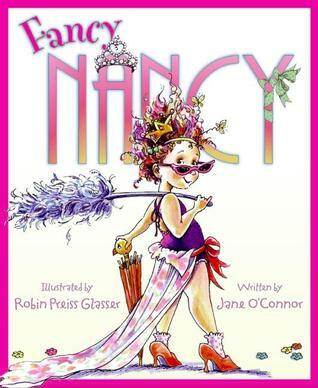 Lila has a huge love of dress up and pretend play and went as Fancy Nancy- the main character from a warm and funny book about a girl named Nancy who like all things fancy and glamorous. It was a fun and easy costume to put together- gathering together a tiara, colorful hair bows, sunglasses, a fancy skirt and glittery shoes and a bright orange duster. On that morning, parent volunteers went to classrooms to read to the kids. The day before, I asked Lila to help me pick a book to read to her class and she went straight for a book on our bookshelf- And Tango Makes Three by Justin Richardson and Peter Parnell, illustrated by Henry Cole. Her class is obsessed with learning all about penguins, and it was easy to see why she gravitated towards this book, which narrates the true story of two male penguins in New York City's Central Park Zoo who became partners and raised a penguin chick. I adore this book, with its sweet story of a non-traditional family; the illustrations are adorable. So I can't understand the fuss around And Tango Makes Three being as controversial as it is and the number one banned book in the country. Not wanting Lila's (very excellent) teacher to be taken aback by my choice of book, I sent a quick e-mail explaining that I was going to read this book aloud and the teacher responded and said, go for it. And that's how I ended up reading a banned book in my kindergartener's class! 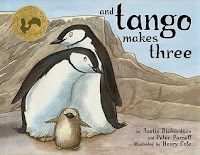 The kids were excited to read a story about penguins, we all aawed at the penguin chick being born to two devoted daddies, the sky did not fall and a good time was had by all. Here are a couple of other interesting books that we randomly picked off the library shelves recently. I am different! Can you find me? by Manjula Padmanabhan has many fun features and kept Lila entertained for a long while- each page has an artfully done picture puzzle, the question "Can you find me" in sixteen languages including Hebrew, Hawaaian, Cree, Swahili, Hindi, and a little write up of words in English that come from that language. We enjoyed using our powers of observation to figure out the puzzles and learned interesting things, like that the words gumbo, tote and yam come from Gullah, a Creole language developed by people who came to America from different parts of Africa as slaves. Human Footprint by Ellen Kirk chronicles everything you (in this case meaning the average American) will eat, use, wear, buy and throw out in a lifetime. It makes for some pretty spectacular statistics. Some of the facts were eye-opening to me. For instance, every year, you'll buy 48 new things to wear and will spend $52, 972 on your clothes in your lifetime. Really? In the picture above is Lila's favorite page, the one saying that you will eat over 14,000 candy bars in your lifetime, enough to fill 12 shopping carts. It was fascinating to read through this book and see how we compared to the national average, and knowing that even in the cases where I personally am far below the average (in candy bars and clothes shopping, for sure), I consume far, far more than billions of humans on this planet. The book has a few tips for decreasing one's footprint- basic stuff like using cloth bags for shopping, using refillable water bottles, eating more plant based food, recycling aluminum cans, and not wasting food. Finally, the best 75 minutes I spent this weekend- our public library hosted their semi-annual book sale, a gym-sized room full of gently used, donated or ex-library books that are sold to benefit the library. I was able to leave the kids at home and spend a glorious Saturday morning browsing through the tables. You can buy a large paper sack for $10 and fill it up with as many books as you can. As you can, I did just that, hauling home a paper sack bursting with 21 books. 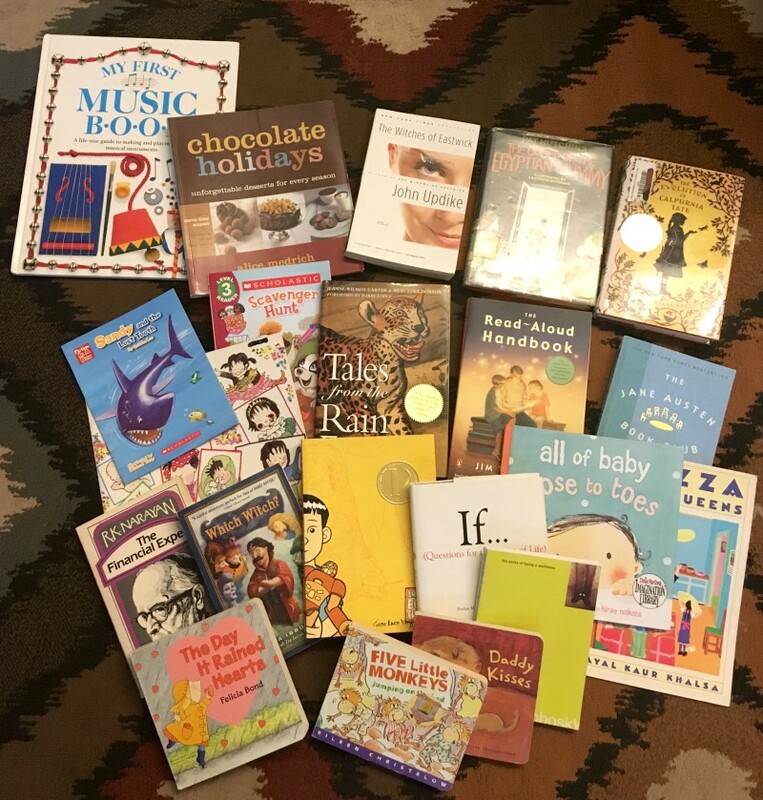 I found some children's books, baby board books, YA books, random novels, and an Alice Medrich cookbook. My favorite find- American Born Chinese, the graphic novel by Gene Luen Yang. I've read it and loved it, and bought it as a gift for V.
What are you cooking and reading these days?